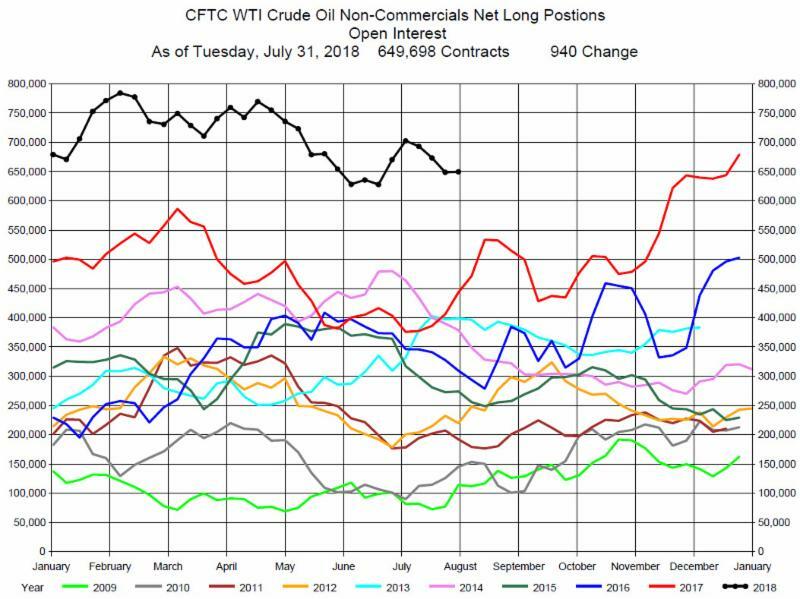 The latest CFTC Commitment of Traders Report as of Tuesday, July 31, 2018 shows the Non-Commercials Net Long Positions increased slightly during the week by 940 contracts to 649,698 contracts. 2,995 Long positions were established and 2,055 Short positions were established. The Funds Net Long Positions is basically unchanged. We attribute this to continued lack of price direction in the Crude Oil market. When a price direction has been established we expect the Funds to adjust their Net Long Positions accordingly. The increased participation by the Funds in the Crude Oil market will add to the momentum of the price direction.